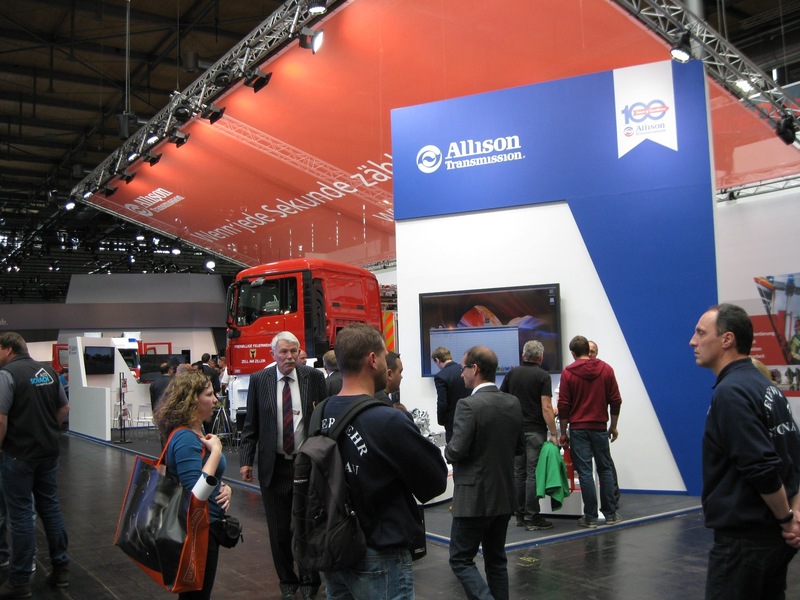 Hannover, Germany – Allison Transmission, the leading global supplier of fully automatic transmissions for medium- and heavy-duty commercial vehicles, has showcased its products at Interschutz 2015. Vehicle manufacturers worldwide offer Allison Automatics for a variety of fire and emergency applications, including airfield crash trucks, ladder and tanker units, ambulances and other equipment. Serving urban, off-road and airfield environments, Allison transmissions deliver high performance and supply uninterrupted power to the drive wheels via advanced Continuous Power Technology™. MAN and Allison have outstanding reputations among fire fleets worldwide, and now the two companies are working together to make MAN TGM and TGS trucks perform even better. Allison fully automatic 3000 Series and 4000 Series transmissions will soon be available in the medium- and heavy-duty classes of MAN vehicles. At Interschutz visitors have seen a MAN TGS 18.400 4×4 chassis displayed by Allison. This specific vehicle was produced to operate in the Austrian Alps, its 400 horsepower engine coupled with an Allison 4000 Series fully automatic transmission delivers exceptional acceleration and performance. Allison 4000 Series models feature torque multiplication and continuous power shifts to ensure unrivalled vehicle launch, acceleration and control, even under exceptional load conditions and over difficult terrain. A Mercedes-Benz Econic 1830 L, 4×2 with HLF 20/16 body (firetruck) and Allison 3000 Series fully automatic transmission was also presented at the Allison stand. The vehicle, currently operating in Hannover, has a smaller than typical turning radius of 13.5 meters due to a rear steering axle. In comparison to a standard vehicle radius of 16.5 meters, the Econic HLF is an ideal vehicle for dense urban areas with narrow roads and alleys. An HLF 20/16 body combined with the Econic low-entry and rear steering axle results in a compact and highly maneuverable vehicle. Allison’s patented torque converter allows for precise maneuvering, even at very low speeds, for the best control in critical situations. In addition, Allison Automatics offer a top-mount engine driven Power Take-Off (PTO) provision, for easy integration of best-in-class emergency equipment. Allison provides the right product for each firefighting and emergency vehicle – whether it’s the 1000 Series™ for ambulance, firefighting and command vehicles or the 3000 Series and 4000 Series for special-purpose vehicles, like turntable ladders and cranes or water tenders and airfield crash trucks. With its Continuous Power Technology, sophisticated electronic features and easy integration of driveline and engine driven PTOs, Allison transmissions increase performance, functionality and safety when lives are on the line. Should paramedics continue to intubate?